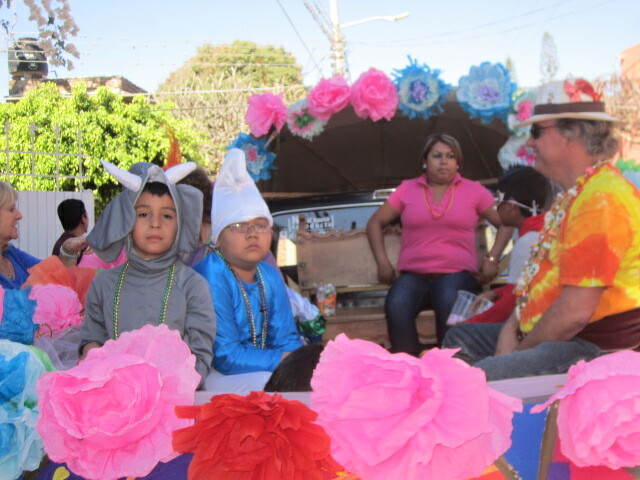 This year’s Mardi Gras parade in Ajijic was on Tuesday March 4th. 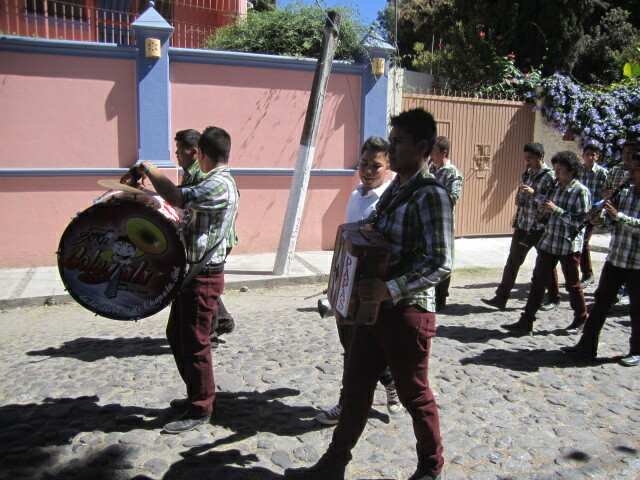 It started around eleven in the morning and went from Constitution to Ocampo to six corners and back to the Plaza. There was also a night parade. This was Fat Tuesday, the last day of the carnival season which always falls the day before Ash Wednesday, the first day of lent. Lent is the beginning of forty days of prayer, fasting and alms giving. 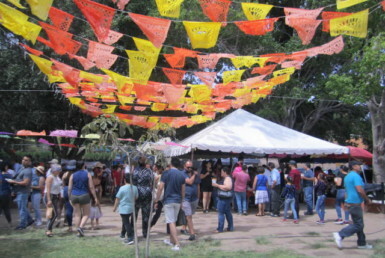 The ten days before the Mardi Gras parade were days of many parties and smaller parades. Every night I could hear the cohetes (fireworks) shooting off in my neighborhood and lots of music in the streets. 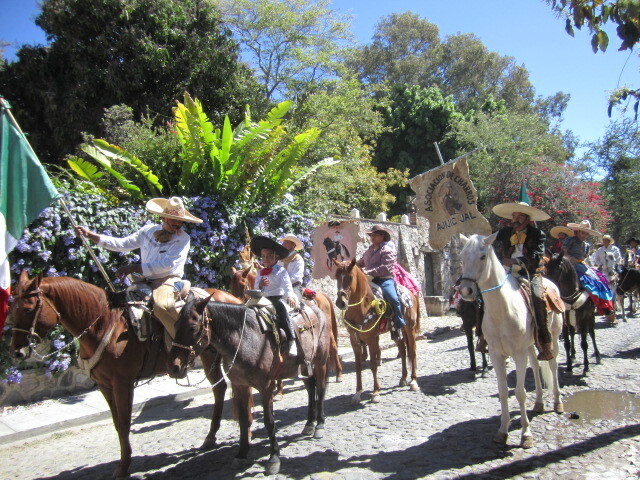 Some of the previous parades were horse parades with a few men dressed like women in the front, throwing flour on the excited children, mostly boys. It is a bit too rough for the girls because the boys run quickly ahead of the parades to try to outrun the flour. Not likely. Every boy was always covered in flour. Great fun for them. The biggest Fat Tuesday parade was the accumulation of excitement for everyone involved. 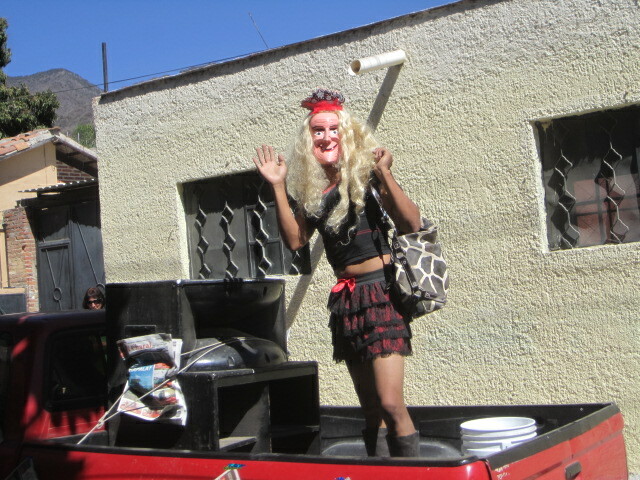 There were many men dressed like women, devils, monsters, etc. And everyone carried a sack of flour to throw on the crowds that lined the sidewalks. I tried to hide but it was no use. One man went after me specifically when he saw I was trying to hide. 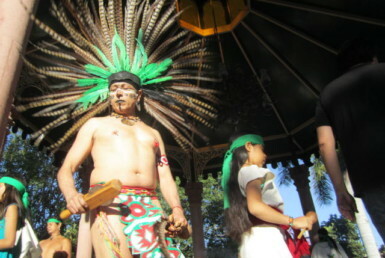 The men dressed like well endowed women are called Sayacas. 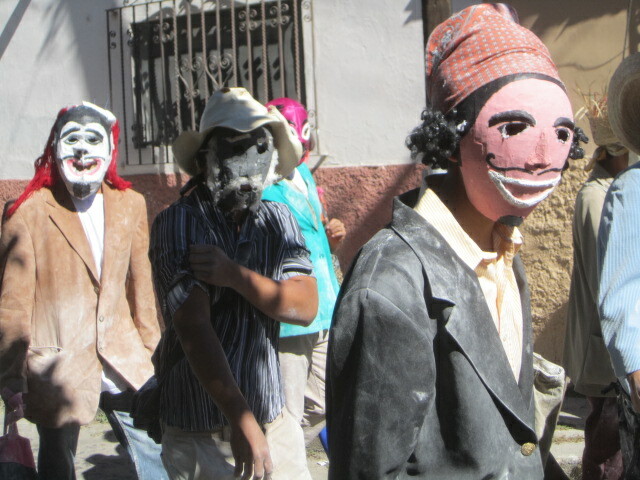 The masks are worn to give the revelers an escape from society and class constraints. Besides, what man wouldn’t want to dress like a well endowed woman and dance through the streets throwing flour on all the onlookers? Mardi Gras is a Christian festival borrowed from the pagans. 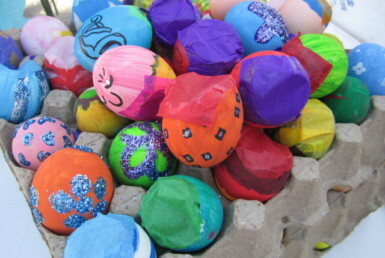 The pagans who survived the dreaded winter, showed their appreciation to their gods for surviving by throwing flour (the symbol of life) into the fields. 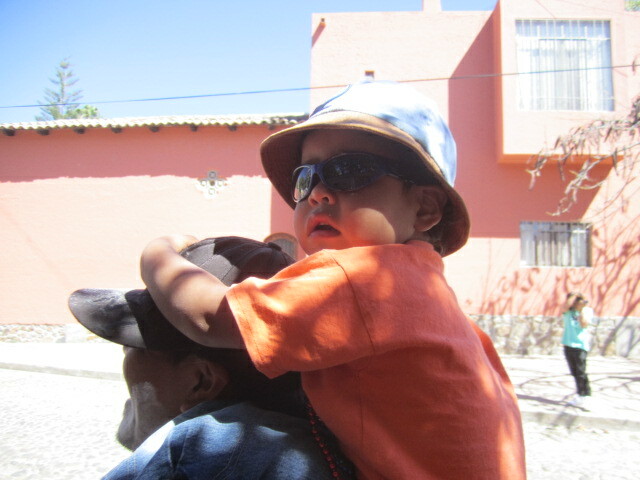 So far, the little boy on his daddy’s shoulders didn’t get floured but if you look closely you will see that his father’s face got it. 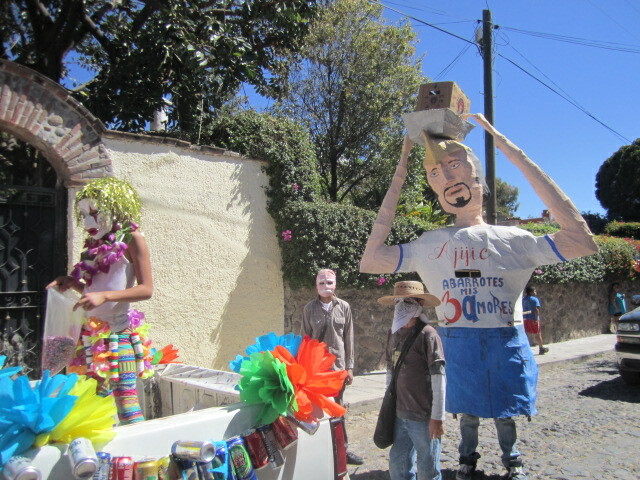 Many people were walking around selling things before the parade. One man had his arms loaded up with small stools. 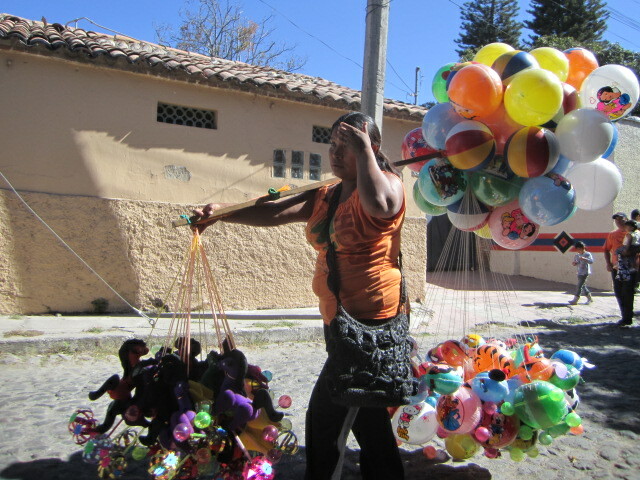 The woman in the above photo had balloons and toys. 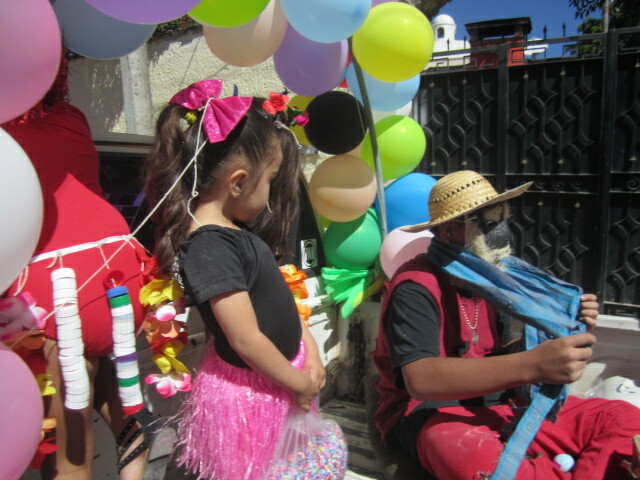 There were people selling ice cream and cotton candy and fruit. I always enjoy seeing the floats but I keep my eyes pealed for sacks of flour. 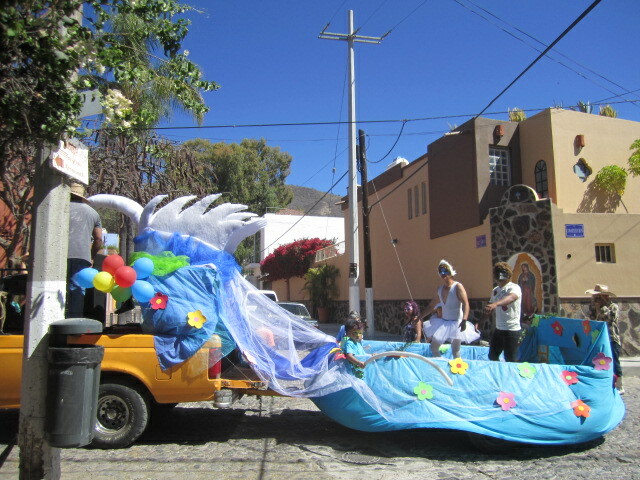 There were many floats in this year’s parade. 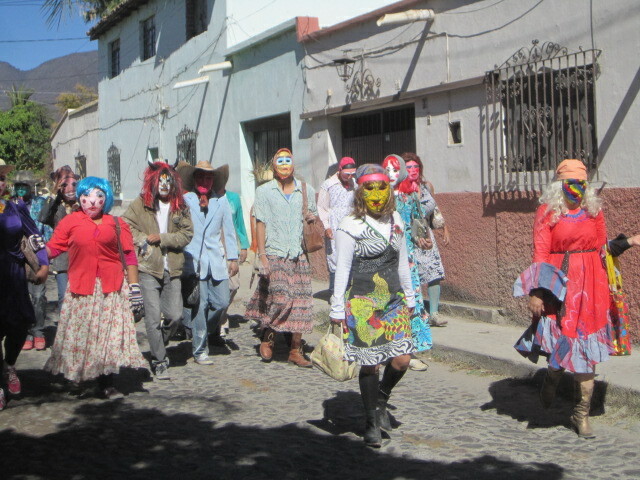 I have looked at the above photo many times and I still can’t tell if the person wearing the mask is a man or a woman. I guess it doesn’t matter. Man or woman, the person appears to be having fun. Notice the bag on his or her shoulder. It is most likely filled with flour. 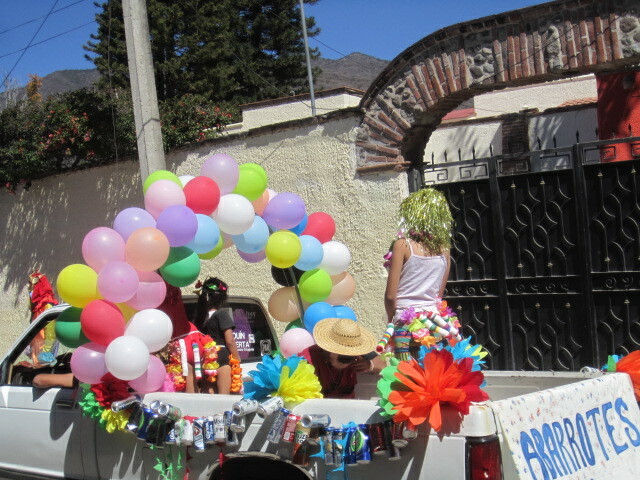 Many of the floats were sponsored by local organizations or businesses. Of course, what is a parade without beautiful young women? These two are getting ready with some help. Some floats I could not figure out. 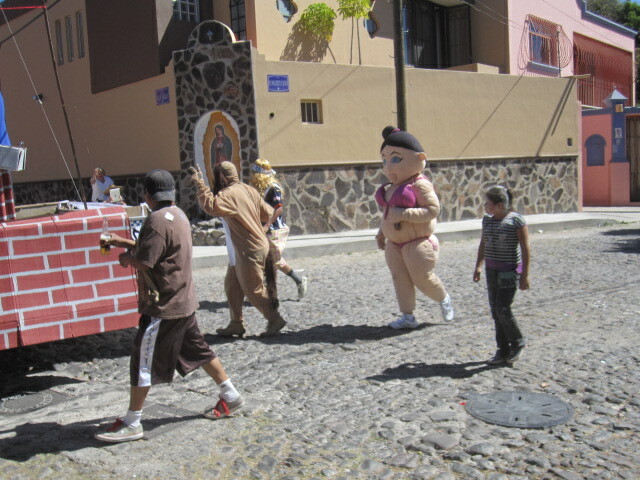 I have no idea of what this float represents or why that man (or woman) is dressed in the ballerina costume. 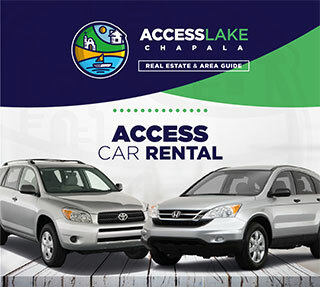 And what is that other person pointing at? Maybe it is best not to try to figure things out in a parade like this. Just enjoy it and try to avoid getting floured. The band was doing a good job of keeping everyone in step. The best description of it is one word; LOUD. 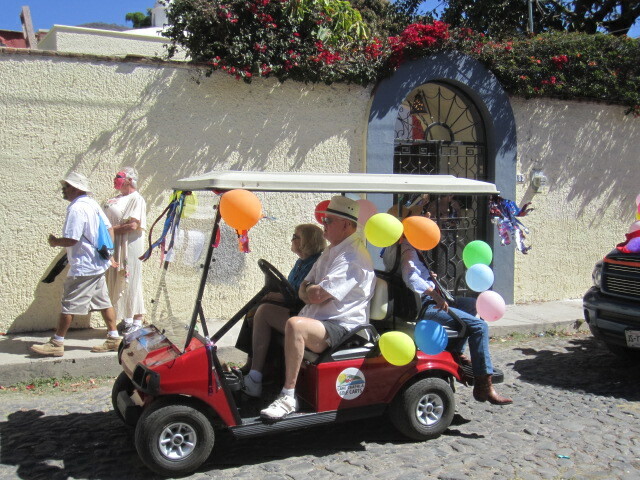 Even the expats were involved in the parade. They were keeping their eyes on the two men on the sidewalk carrying flour. The children in the above photo looked kind of tired or bored. I have no idea of the meaning of their costumes. Maybe they didn’t either. 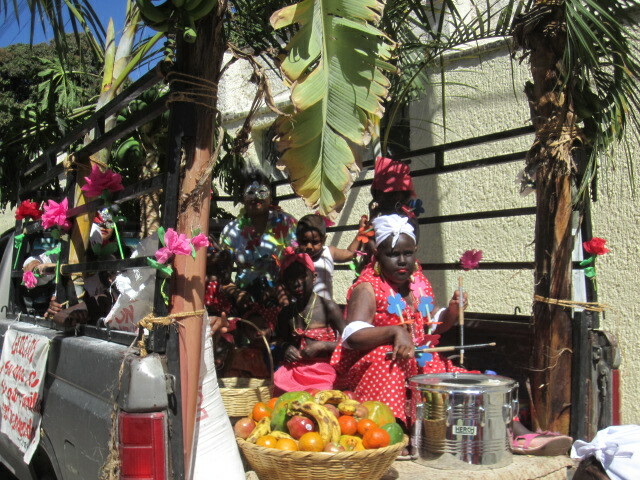 The children in the float in the above photo must have represented one of the Caribbean Islands. Following them were dancing women and children. In the photo below no one was dancing. By the time they got to where I was standing, they were tired. 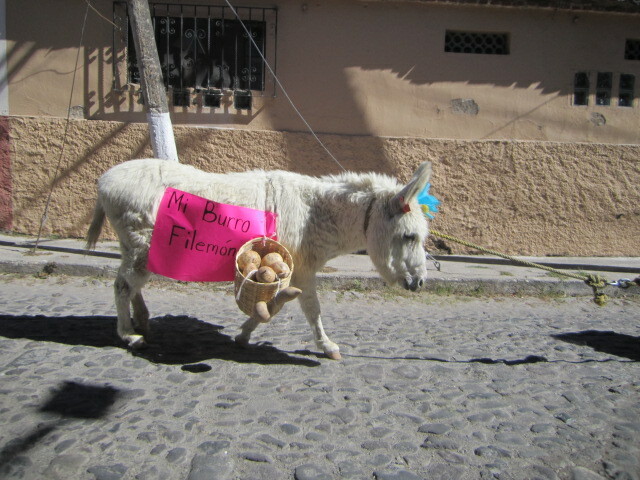 The burro in the photo below also looked tired but she was being pulled by a rope. No resting until the parade is over! The little girl in the photo below seemed very curious about the man in the face mask. She had a bag of confetti in her hands but she was too interested in the man to throw it. 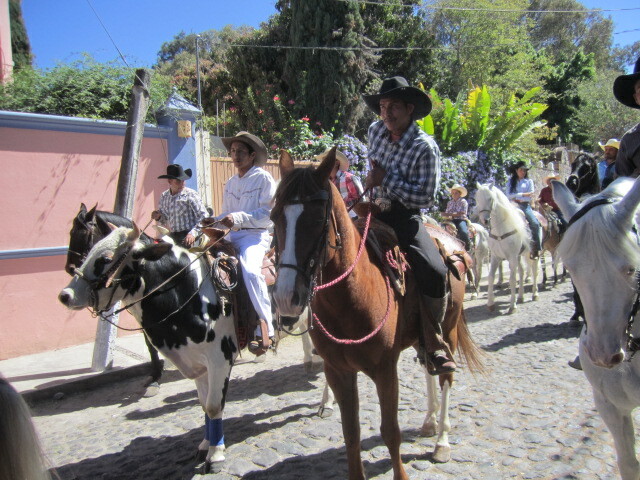 Last, but not least, came the horses. I always enjoy seeing them. 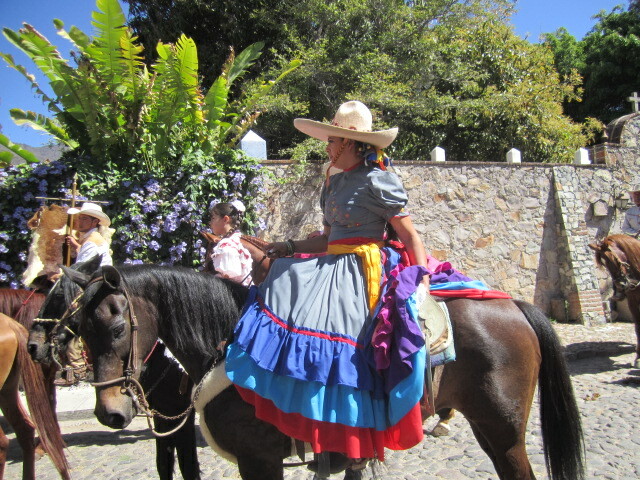 The Escaramuza girls are fun to see with their beautiful dresses. 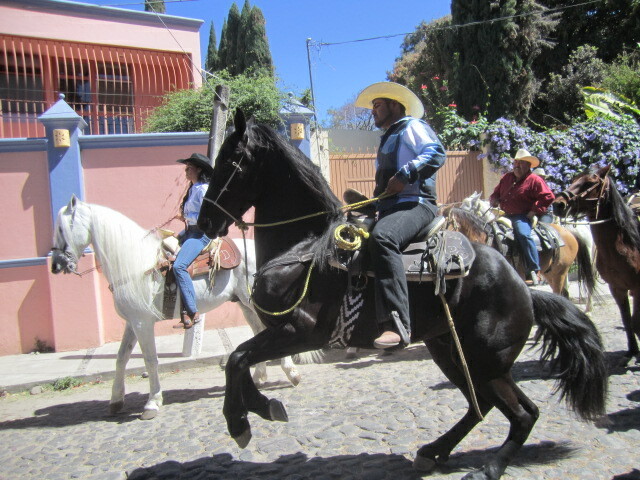 They ride sidesaddle. If you haven’t seen them perform, you are missing out. It is exciting to watch the horses weave in and out of each other and run towards each other, barely missing head on collisions. These are brave young women. And also brave horses. There are always dancing horses in the parades. I love watching them. Why not ride a cow instead of a horse? I wonder what the cow thinks of being in a parade. He can ride the cow but I don’t think he can teach the cow to dance. 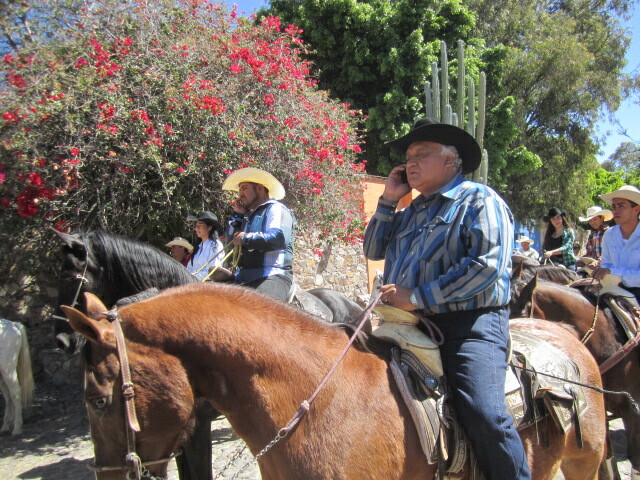 The last photo is of two cowboys, riding side by side, both on cell phones. Keeping up with modern times. So we have come to the end of another Mardi Gras parade. If you are in town next year at this time, I hope you will make a point of watching it. This is my favorite time of the year. The weather is warm but not hot and there is a feeling of excitement in the air. Many people are in town. 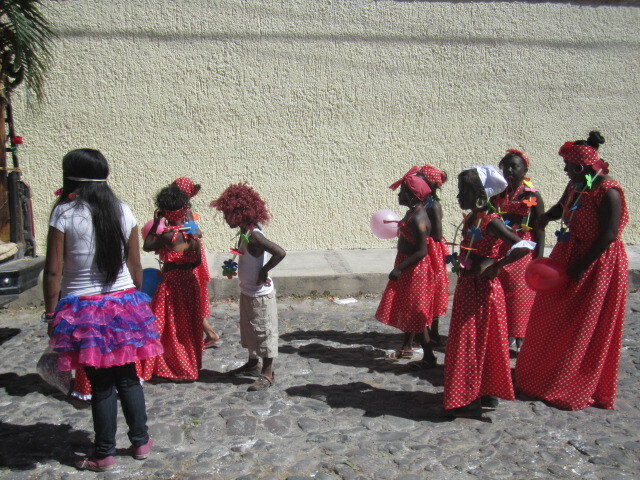 Many parades and dancing in the streets.